The social media explosion has been a huge opportunity for the face-to-face industry. Despite early fears that digital networking was going to kill off live events, show organisers are realising that social channels are not only enhancing the community experience on site, but also helping to turn their brands from ones which are relevant for just a few days each year, to ones which are in touch with the community 365. Ecobuild is one such show which has recognised these benefits and run with them. Since its launch in 2005, Ecobuild has grown to become the biggest event in the world for sustainable design, construction and the built environment; it attracts over 900 exhibitors and 45,000 attendees to Excel in London. Our social media strategy, aligned carefully with our business and marketing strategies, runs year round, however for the purpose of this blog I’m going to tell you about the creative campaign we ran in the lead-up to the show. Our channel of choice is undoubtedly Twitter; while we have social accounts for Ecobuild across a range of platforms, we find that the microblogging service is the perfect complement to live events as it facilitates conversation and connections – exactly what we work so hard at doing on the show floor. Our first engagement initiative was the #Ecobuild100. People love lists (look at the success of BuzzFeed), and this initiative encouraged the Twitter community to nominate their favourite sustainable construction, design and built environment accounts. During the three weeks of the campaign we received nearly 300 influencer nominations. We used Peerindex to initially rank the list of nominees (we’ll be going back to Klout as Peerindex has now removed the group list functionality), but the final 100 was curated by the Ecobuild team and listed alphabetically. We felt it was important to cast a human eye over the nominations to ensure that the list would feature truly useful, knowledgeable and expert users, rather than a list based on a faceless algorithm alone. Using GleanIn we were able to calculate that the campaign’s reach exceeded 2.5 million on Twitter – not bad for a list of 100 influencers. The Ecobuild100 engagement didn’t stop there as we invited all the participants in the final list to write a piece for our show blog on the website, bringing more industry thought-leadership and discussion under the event brand. This was a really strong initiative to kick off with as it generated a fantastic buzz, produced some excellent content for people to share, highlighted the influencers in the community, and got people talking about the show. Following on the heels of this success we launched the #Ecototem campaign. This was a collaborative campaign with BBM Sustainable Design and BBP Consulting Engineers who had commissioned a 9m totem designed to change current mindsets of waste as an inconvenience to that of a valuable resource. Our @Ecobuild_Now followers were invited to submit slogans via Twitter using the #Ecototem tag, answering the all important question ‘what is the future of waste’? 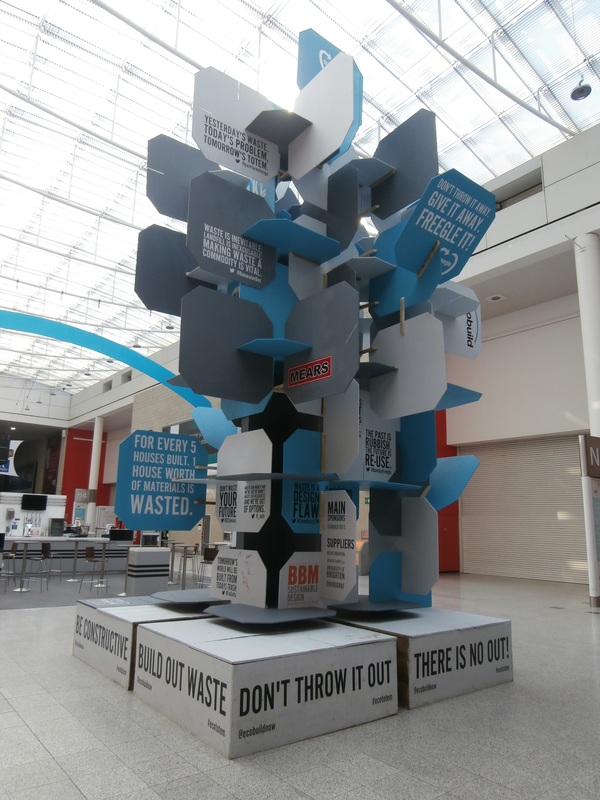 Twenty of the most inspirational slogans were selected to emblazon the waste totem in the central boulevard at Excel. The slogan judges included Cat Fletcher, Freegle’s waste management expert, (who had been recently acclaimed in the national press as the ‘human womble’ for furnishing her home for free with other people’s rubbish) and eco-architect Duncan Brown from BBM. The brilliance of the campaign concept was that it brought together both the live and digital sides of the event. The community was able to contribute to campaign digitally pre-show and see the result live on-site. It didn’t hurt that it was a fantastic photo opportunity, I can’t tell you how many I saw being shared on the social channels we were monitoring during the event. Our on-site strategy aimed to convert those who had pre-registered into showfloor attendees. As Ecobuild is free to attend there’s no financial incentive to visit the show and combined with people’s busy lives, encouraging them to visit us over working on their current project is a hugely important component of the strategy. To manage the sheer volume of content which we could have been promoting on Twitter (over 140 seminar sessions alone) we launched seven additional Twitter accounts which automatically fed sector specific information throughout the event. This avoided us spamming people’s Twitter feeds with irrelevant content during the event – unless they wanted us to! Our biggest weapon was the launch of our live blog. The blog enabled us to report live from the show, share photos and videos, link to interesting events happening on stands around the showfloor, and link out to what the community was talking about on their own blogs and social media. It not only gave the community a taste of what was happening on site in order to boost, but for those who truly couldn’t make the show we were able to reach out through digital channels to bring the Ecobuild experience to them, direct to their desks. During the course of the campaign nearly 10,000 people tweeted about Ecobuild, reaching a potential audience of 13.7 million. Of those, half tweeted during the three days of the event reaching a staggering audience of 4.6 million. We’re are looking to top this for the next event in March, with the campaign kicking off in early 2014 – you’ll have to check back next year to see how we do.